A headset microphone is good enough when you’re gaming with friends and communicating over voice chat. If you want to show off your skills to the world however, you’ll need to upgrade. Low-quality audio leads to people losing interest no matter how funny you are or how well you play. Throwing a little cash towards a dedicated microphone will make this problem disappear. 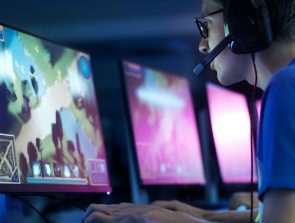 Most new Twitch streamers neglect how they sound in favor of better video quality or a gaming rig upgrade that will let them run the latest games at better frame rates. 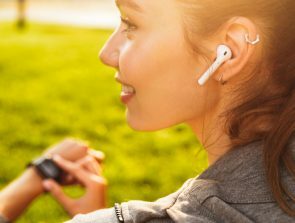 While these are important, investing in a microphone helps fans connect with you better. They get to hear what you really sound like, can understand you more clearly, and experience your joys & frustrations more vividly. Stand-alone microphones are versatile as well, so if you ever want to invite someone over for a streamed talk or try your hand at performing live music, you won’t need to get a second one. Selecting a good streaming microphone can be challenging as they’re in demand and the market is bristling with choices. We’ve chosen the six best microphones for Twitch based on their quality, price, and range of features to help you make a quality choice. Check out the reviews below and find one you and your fans will love. Very affordable, outstanding recording quality for the price, doesn’t hinder movement. Portable yet sturdy, intuitive configuration software, minimalistic controls. 3 distinct polar patterns, excellent build quality, great recording quality. 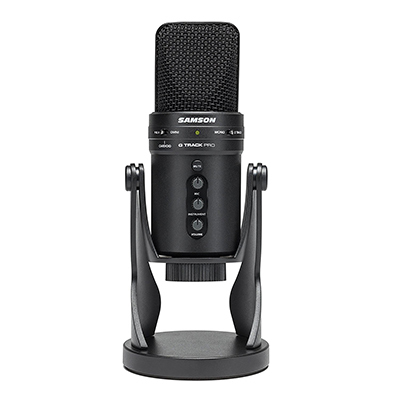 Treating your Twitch followers right means investing in a studio quality microphone, which is why Samson’s G-Track Pro should be your first choice. This excellent recording device is sturdy, reasonably priced, and brings versatility with its external input and three polar patterns. Whether you stream gameplay, take song requests, or organize round table discussions, this is the mic which will handle any streaming challenge flawlessly. 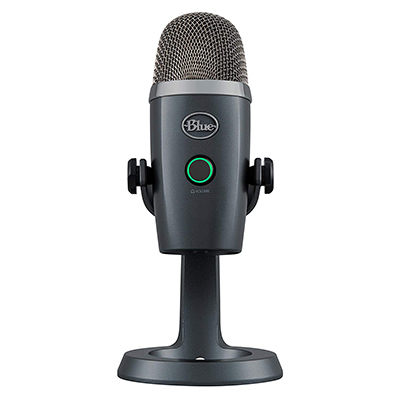 Like its main competitor, the Blue Yeti, the G-Track Pro is a solidly-built condenser microphone with an all-metal body and elegant shape. It’s available in either matte black or silver. At 3.5 pounds, the G-Track Pro is heavy enough to stay standing if you accidentally push it. The mic’s front is covered with dials and switches which let you mute it, control various volumes, and cycle through polar patterns. There are three polar patterns to choose from – cardioid, two-way, and omnidirectional. Streamers who mostly game or speak to fans will stick to cardioid as it is the most focused pattern that mutes any sound which isn’t coming directly in front of the mic. Omnidirectional is perfect for musicians who regale their audience with live performances as it lets them capture an entire room’s acoustics. Finally, two-way comes in handy when you’re interviewing someone or have a guest commentator since it records sound in a figure-eight pattern. Another great thing about the G-Track Pro we haven’t seen at this price point is its 6.3mm input jack. This lets you plug another microphone into it to create a high-quality stereo setup. You could also plug a guitar into it and record its output directly without loss of clarity. A 3.5mm monitoring jack is present too. This is useful when you want to monitor how your voice or performance sounds to your viewers. Both jacks as well as the mic itself have their own well-made volume adjustment knobs. The G-Track Pro records audio in 24-bit quality at a sample rate of 96 kHz. The sample rate might not be as high as that of more expensive professional microphones, but no one will be able to tell the difference in a streaming environment. The mic connects to your computer via USB-B and is plug & play so it will work right away without firmware updates or additional software. While the G-Track Pro’s overall build quality is excellent, the toggle switches are cheaply made. They’re plastic and the one that’s used to select the polar pattern has a tendency to skip over the middle setting. Since this happens to be the most frequently used cardioid pattern, you’ll need to check the mic before starting to stream to make sure that it is set to record only your voice. A Twitch microphone doesn’t need to be cumbersome to deliver great-sounding results, as evidenced by Blue’s Yeti Nano. This smaller, stripped-down version of the Blue Yeti offers two popular polar patterns, a great balance of portability & sound quality, and it’s reasonably priced to boot! It’s a dependable desktop mic perfectly suited for streamers who want to save a buck but still get their whole range of emotions across in high fidelity. The Yeti Nano is smaller and lighter than our overall winner, but it is sturdy and made of metal so it can take a beating never the less. Its physical controls are minimalistic and intuitive. There are two knobs which also act as buttons. The one in the front mutes the microphone if pressed and controls its volume. The one on its back regulates headphone volume and toggles monitoring on or off. There’s a 3.5mm headphone jack on the Yeti Nano’s bottom along with a threaded mount which fits standard tripods. You can also attach the mic to a stand with the included thread adapter. Unlike the original Yeti which has four polar patterns, the Nano supports only two – cardioid and omnidirectional. The good news is that you don’t switch between them based on a digital algorithm – the Yeti Nano has a separate capsule for each pattern. There’s no Digital Signal Processing or DSP either. This means the recording is raw and cleaner. If you aren’t satisfied with it, you can always apply an equalizer through recording software. This microphone is compatible with all recent Windows and Mac OS versions. Every major recording program except ProTools will recognize it as well, and there’s a workaround if you’re a ProTools user which fixes the issue. The Yeti Nano comes with the Blue Sherpa control program. The software lets you switch polar patterns temporarily, adjust gain levels, and more. It’s easy to learn its basics and give your recordings that extra bit of kick. Since there’s no DSP, the recorded sound is crisp and clean. The mic favors mids and highs at its default gain settings, so you can start speaking without needing to tinker with anything. If you plan on recording music with it or have a lower voice, a few tweaks in Sherpa will bring the quality of lows in line. The stand you get with the Yeti Nano doesn’t handle vibrations well, so expect your keyboard to be heard as you’re typing. The microphone’s placement is important. You shouldn’t place it too close to your mouth since Bs and Ps will pop audibly. USB microphones offer good quality and ease of use, but if you’re aiming for the very best results an XLR mic like the Audio-Technica AT2020 is in order. It requires some audio knowledge and is more complicated to set up than a USB mic, but the increase in quality you’re getting is well worth it. If you’re a professional streamer with a large following and want to delight your audience with the best possible sound quality $100 will get you, the TA2020 is the obvious choice. The AT2020 is one of the most boring-looking mics we’ve tested and only comes with two accessories – a carrying pouch and a stand mount. The latter is concerning since you’ll need to already own a mic stand if you don’t want to hold the mic while recording. On the other hand, this forces you to get a stand which minimizes the impact your surroundings make, eliminating the sounds of whirring fans and clicky keys. In spite of its boring appearance, the AT2020 delivers both in build quality and performance. It is made from cast metal and its single 16mm cardioid capsule is well protected with a strong mesh. Controls on the mic are limited to its on/off switch and a headphone volume wheel. The AT2020 uses XLR input and doesn’t come with an XLR cable. This means you’ll need to have both a cable and an analog mixer before you can use it. Why is this microphone so high up then with so many hoops you have to jump through to get it to work? Its sound quality is amazing! Recorded voices are warm and expressive. There’s no interference from other sounds and the AT2020 is forgiving to people who strongly pronounce their plosives as there’s no popping even at close range. The AT2020 isn’t a microphone for beginners. You need to separately purchase a mic stand, an XLR cable, and a mixer to use it, which is fine if you already have the equipment or want better quality than what a USB mic can deliver and don’t worry about the cost. Novices and more budget-conscious streamers may think that the hidden costs and additional knowledge required to use the AT2020 aren’t worth it though. Do you have a quiet or high-pitched voice and struggle to be heard with your current mic? 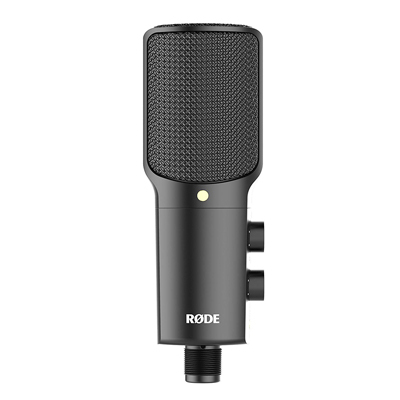 In that case, you should definitely get Rode’s NT-USB condenser microphone! Its excellent sensitivity allows the mic to pick up even faint sounds directed at it and give them richness. That’s not its only use case though – the NT-USB is great for any Twitch streamer who goes for substance rather than over-the-top style as it does a fine job of broadcasting your every word in crystal clarity. Unlike the AT2020, Rode’s microphone comes with lots of welcome accessories. We are most impressed with its tripod mount and pop shield. The mount is stable and absorbs vibrations coming from your desk well. The pop mount prevents you from getting too close to the mic and makes your Ps and Bs sound natural. You also get a long USB cable, a ring mount, and a direction booklet. Audio output balance controls are a unique thing about the NT-USB. There’s the standard volume knob for headphones, but next to it there’s also a knob which controls the balance between recorded audio and audio coming from your computer. This means you can stream gameplay, quickly check how your followers hear you, and tune back into the game or a conversation with teammates with a simple knob twist! Since it only has a cardioid capsule, the NT-USB is suitable for vocal recordings. If you keep your mouth at a distance of 6 inches from it, the microphone will record everything from a muffled whisper to a rumbling bass with excellent clarity. The quality of its recordings doesn’t get worse if you move backwards either, so you can sit back and have a chill conversation with your fans without starting to sound bad. Everything bad about this mic has to do with its accessories. The ring mount which attaches the microphone to stands is made from thin plastic and may break with frequent use. The direction booklet is vague and doesn’t offer much advice for first-time users. Audiophiles insist on quality headphones to get the best immersion when gaming. Trouble is, this leaves them without a microphone. 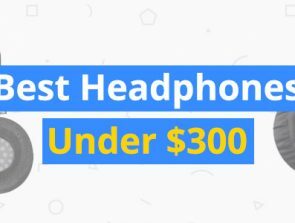 If you already have an expensive pair of headphones, you don’t need to compromise on audio quality by buying a gaming headset. Get the ModMic 5 by Antlion Audio instead! It’s a high-quality microphone that attaches to your headphones and turns them into a headset capable of studio-grade voice recording. With it, you can stop thinking about maintaining the distance between yourself and the mic and focus on racking up a good score. The ModMic 5 is a featherweight microphone which attaches to your headphones and connects to your PC through the standard 3.5mm mic jack. It comes with a disc that needs to be permanently fixed to the headphones with adhesive tape. The microphone and its arm are secured to the disc magnetically so they aren’t a burden if you want to take them off when listening to music. Now you’ll have two audio cables to contend with, but Antlion solves this issue by providing a sheath that binds them together for less clutter. Modularity is another point in the ModMic 5’s favor. You get two interchangeable cables with it. They’re 1 and 2 meters long respectively so you can use the shorter one if your case is on the desktop and the longer one if it’s on the floor. There’s also a mute button that goes between the mic and the cable. 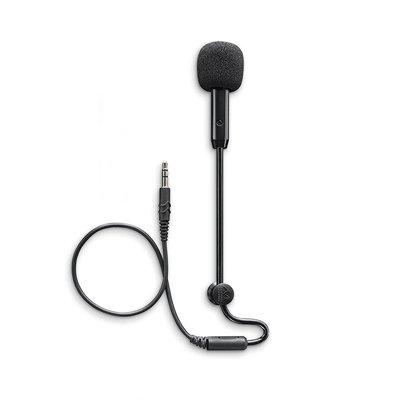 This microphone has two capsules and can be switched to a cardioid or omnidirectional polar pattern. This is unusual for microphones meant for use with headphones as they have only cardioid capsules that capture nothing but the user’s voice. Switching to omnidirectional will pick up ambient noise, but it adds richness to your voice if you’re streaming in a quiet environment. The difference in recording quality between the ModMic 5 and even high-end gaming headsets is noticeable. Voices recorded with the stand-alone ModMic 5 sound fuller, the sounds your computer makes aren’t recorded, and popping is nowhere to be heard. The ModMic’s cable isn’t shielded from electrical interference. This might cause a slight hissing sound to be present on recordings if its cable is close to your computer’s power cable. The cable sheath will work with most headphones but won’t be of use if yours have a telephone-style coiled cable which is too thick to fit. 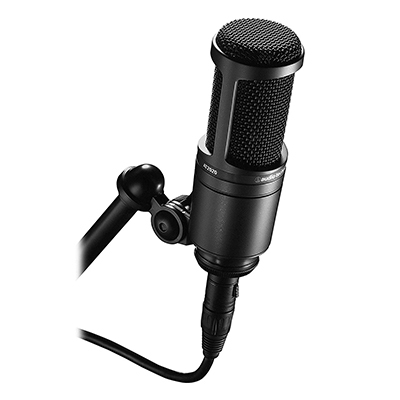 Are you just starting to stream and don’t want to spend much on a dedicated microphone? Do you often invite friends and guests over while streaming and need a reliable backup mic to hook them up? 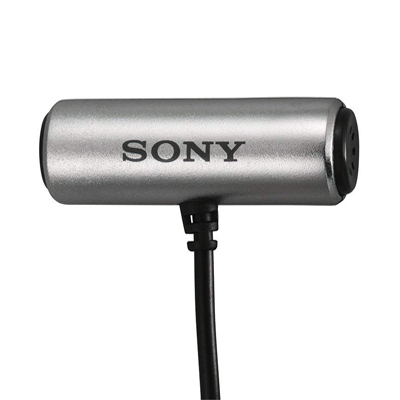 Believe it or not, you can get the flexibility of a livelier mic and decent audio quality for less than $20 by purchasing Sony’s ECM-CS3. It isn’t as advanced as the more expensive entries on the list, but if you’re looking to get a mic as cheaply as possible without it sounding like garbage, it’s hands down the best option. The ECM-CS3 is a tiny silver lavalier mic that attaches to your shirt or a lapel. It weighs only 0.4 ounces, meaning you won’t even notice it’s there. The mic has a mini 2.5mm plug and comes with three feet of cable, so you might need to purchase an adapter and an extension cord if your computer isn’t close enough. The mic uses an omnidirectional polar pattern so you’ll want to be in a quiet room while streaming. This isn’t ideal if you’re playing a game and frantically pressing keys a lot since they’ll be heard. However, Twitch streamers who focus on interacting with their audience, playing music, or chatting with guests should have no issues. Surprisingly, the audio quality is above average. There’s no background hissing, popping is kept to a minimum, and you don’t need to worry about not being in the sweet spot since the mic is always at the same distance from your mouth. The omnidirectional polar pattern comes into its own when you want to draw attention to sounds in your surroundings. The ECM-CS3 will faithfully pick up music you’ve got playing in the background as well as your own performances. Costs needed to be cut somewhere and Sony has chosen to sacrifice the ECM-CS3s build quality rather than performance. The mic’s plastic body is thin and feels cheap. You’ll have to be careful when handling the ECM-CS3 as it has a good chance of breaking with rough use.